Tap the screen to select the option of the output you would like (Mobile Device, USB Key, Google Drive, OneDrive, Dropbox, your Email address, or your Print Job at the library). If you choose Google Drive, OneDrive, Dropbox or Email, enter your account information. Choose your color: Color, Grayscale, or Black & White. Choose the Quality: Standard or High Quality. 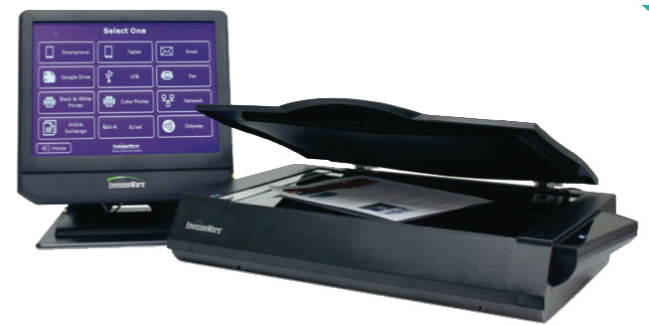 Place the document to be scanned on the scanner in any direction, even crooked! NO LINING UP NECESSARY! Tap Press to Scan at the top of the screen. After the document scans, you can view and edit the document (crop, rotate, etc.). Mobile Device: the system will generate a QR Code.Scan the QR code and your document will automatically load on your mobile device. USB Key: insert your key in the USB drive. The system will automatically save it to your USB Key. Google Drive, OneDrive, Dropbox or Email Address: your job will be sent to your account with the information provided. Print Job: the document will be sent to the print station, to the left of where you scanned the document (print fees apply). Finally, you will see a Confirmation Screen. Select either I’m Done or Scan More...The system will automatically log you out after 2 minutes.